Living Space: 2 sq. ft. 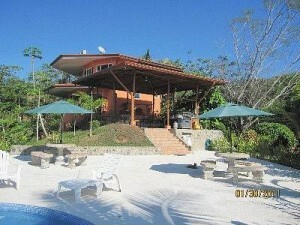 This tastefully built 2 bedroom home is located in a 9 lot gated community call El Paraiso. It is half way between Dominical and Quepos and only 5 min from the paved coastal highway on an excellent gravel road. The 6.7 acre property has expansive ocean and mountain views. The house is fully furnished and includes 2 Master Suites (2 bedroom / 2 1/2 bath) with up to 2500 square feet of living space, including Living Room, Kitchen, Master Bedroom, Master Bath with Jacuzzi whirlpool, Guest Suite, Guest Bathroom and many more luxury amenities. There is also a large covered BBQ area outside perfect for entertaining and a huge pool deck and a infinity edge dipping pool! The owners also started to build a 1 bedroom guest house. All of the grey work including electrical and plumbing has been completed. All that needs to be done is the finish work. The current owners rent the house out and do quite well. This home is a great investment. It would make a great retirment home, full time residence, or income producing property!! !